This year at Sunshine Coast Grammar School we have established a Permaculture Garden with the assistance of Leonie Shanahan. The area that we used for the garden was boggy and unsightly and was unusable for most of the year. Leonie discussed garden design with the children and together, they decided which features would be best for our garden. 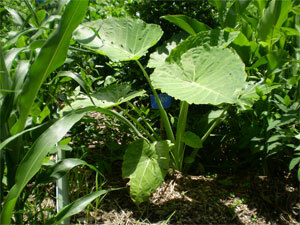 Tank gardens were used in the damper areas and taro was to be planted in the bog. The parents were invited for set up day and they helped to build the garden. The results at the end of the day were amazing and the area had been transformed into a show piece. Over the ensuing weeks, the garden was planted with herbs and vegetables. The children watered and cared for the plants, delighting in watching them grow. A chook pen was built and three chickens roamed freely around the garden. We culminated with a Harvest Day, where the vegetables were picked and made into salads and meals that we shared with the parents. People's lives are very busy these days and they often don't have time for gardening. Therefore creating the garden was a fabulous experience for the children and many of them began a vegie garden at home. One child was having trouble growing vegetables because the soil was unsuitable but used the mixture that we used at school and had fabulous results. Others grew herbs in pots and planted different varieties of herbs that they hadn't tried before. We now have a wonderful asset at our school that children from all grades enjoy. They wander around smelling the different herbs, delighting in how much the vegetables have grown or cuddling the ever patient chickens. It is a credit to Mrs Shanahan and her Permaculture helpers that they have helped us to create such a showpiece for our school.